The beauty of this quaint town is spread in ribbons. A steep hilly ridge is beautifully encompassed by emerald-green tea plantations. Darjeeling is dominated by magnanimous Khangchendzonga (8598 m). Also reckoned as one of the best hill stations across the country. A visit to this pituresque town will offer you a huge variety of attractions. 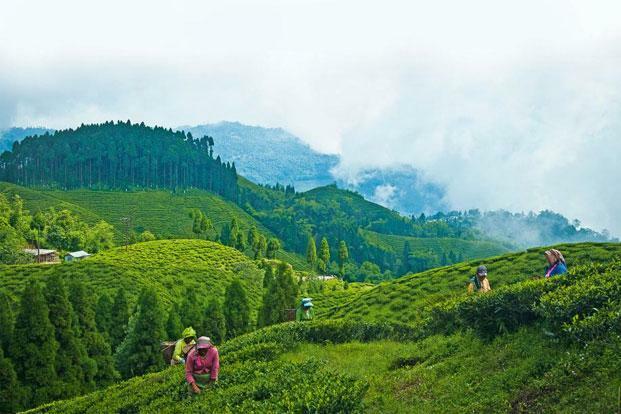 Right from the mesmerising tea gardens to eye catching orchids, rhododendrons, pines and fairytale Himalayan toy train riding its way through beautiful slopes, the lip smacking variety of food, amazing activities and exciting shopping options, this irresistibly beautiful town has a lot to offer. This is the place you will get to see the enrapturing hues of sunrise. Your tour to Darjeeling is incommplete without a visit to Tiger Hill and witnessing sunrise at Tiger Hill. You would simply love the way sunlight falls on these snowcapped Kanchenjunga peaks. It beautifully illuminates the entire place in exquisite colours. You would simply love the breathtaking views. Monasteries in Darjeeling are a must visit. The most beautiful of all is Zang Dhok Palri Phodang. The amazing monastery holds a lot of significance because it houses rare scriptures brought to India post Tibet invasion in 1959. Hence, a trip to this soothing sanctuary must be on top of your list of best places to be in Darjeeling. The beautiful Peace Pagoda sits atop Charlimont Hill beautifully and renowned as one of the 30 peace pagodas across the globe. These were established by Japanese Buddhist monk Nichidatsu Fuji with an aim to promote World Peace and harmony. When in Darjeeliing, you should visit pagoda to enjoy an outright tranquil and serene experience. This place offers one of the best river rafting experiences in India. So head to the Teesta river as you enter Darjeeling and you will come to know why it makes for one of the best things to do in Darjeeling. The activity is a sure shot fun for all adrenaline junkies! You would experience a series of rapids with varying intensities here. These range from Grade 1 to 4. From novices to seasoned rafters, the river has something great to experience for all! When it comes to body art, Darjeeling is no less than Goa. The place is loaded with a number of amazing permanent and temporary tattoo parlours with skilled artists offering the best of services. Trusts these tattoo artists to turn your body into a brilliant masterpiece. Available at almost every nook and corner, these partlours add to the hippie impact to the picturesque location. These are also easy on budget. You need to venture into the world famous Batasia Loop. This junction holds scenic and historical significance and a great option for sightseeing in Darjeeling! Bastia Loop is a very popular railway loop that moves around the open-air Gorkha War Memorial. It was established to honour brave soldiers from the area who laid down their lives during the WWI and WWII. Visit this amazing place for an unforgettable shopping experience. The market is a row of temporary stalls. These are set up by local Bhutias and located on a narrow lane leading to Chowrasta (The Mall), next to the famous Nathmulls. Also referred to as a shopping paradise for tourists, it is a place you should visit for winter wear such as gloves, sweaters, woollen caps, mufflers, jackets and fashionable jeans at very reasonable prices. Do not forget to visit the Nathmulls and purchase Darjeeling Tea sold here. You must visit the amazing hotel that adds a very unique touch to beautiful town of Darjeeling. This is a Beatles-themed hotel providing beautiful music amalgamating both eastern and western influences. A budget friendly Bed & Breakfast Lodge, the interiors incorporates art of this popular music band. The amazing experience needs to be experienced in order to believe it! Well, this is a local treat that promises to kill winter blues. A type of chewing bar, Churpi promises a delicious flavor. The best part is that keeps your body warm during winters and provides energy to the body. Churpi is available at street shops selling groceries and is available at a very nominal price. You can take these home and enjoy during winter. The exquisite tea gardens of Darjeeling are world famous. Hence, there’s no reason you should miss out on taking a trip down to the Dooars. This will let you have a close glimpse of sprawling beauty and sip on world famous refreshing ‘Darjeeling Tea’. You would be mesmerized to see verdant pruned bushes that makes for a magical sight. A visit to Dooars will make your Darjeeling trip memorable for a lifetime. When in Darjeeling, you must go for a nice trekking trip to Sandakphu, the Highest Point of West Bengal! This is an absolute essential for adventure lovers. Being the highest point in the state of West Bengal, it is perfect destination for all trekking fanatics. Situated at an astonishing height of 3,636m, Sandakphu is known to offer the most breathtaking views of the gigantic Mt Everest and the majestic Kanchenjunga Peak. Love adventure? Then you must test your mountaineering skills at Jawahar Parvat. Here, the Himalayan Mountaineering Institute will conduct a huge number of mountaineering and adventure courses at different levels that ranges from beginners to expert. The duration of this course is from a month to a few days. Here, you can avail of a Rock Climbing course and many other basic yet very interesting activities. Regardless of duration, the overall experience is unprecedented and completely exhilarating. Cost covers The Basic Course costing INR 4000/- per person. This lasts for a month. Smaller activities such as Rock Climbing and smaller activities are also provided through walk-in. These will cost only 200 bucks per person. These tasty treat will satisfy your hunger pangs in a jiffy. Darjeeling offers scrumptious variety of food options to all its visitors. This is the place where you get the best variety of typical Darjeeling food such as Thukpa and momos. You will find the store at every nook and corner of the town. Stopby at Keventer’s restaurant when in Darjeeling. A refreshing breakfast at Keventers will make your trip a sure shot success. These guys serve the best cheese toast and shakes. When in Darjeeling, you must visit the famous Chowrasta. Also widely referred to as The Mall, it is one of the most popularly places in Darjeeling among tourists. It is a relaxing place where you can enjoy beautiful evening with a cool breeze. The Mall Road stretching through the place is a shopping hub. A trip to Darjeeling at least once in your lifetime is a must have. It will offer you the best of experience in all respects. Darjeeling provides all amazing ingredients to ensure you an ideal break from daily routine.